As some of you might know I am now living in the wonderful country of England. However before traveling here I took some time to wrap things up at home and catch up with old friends in Ohio. 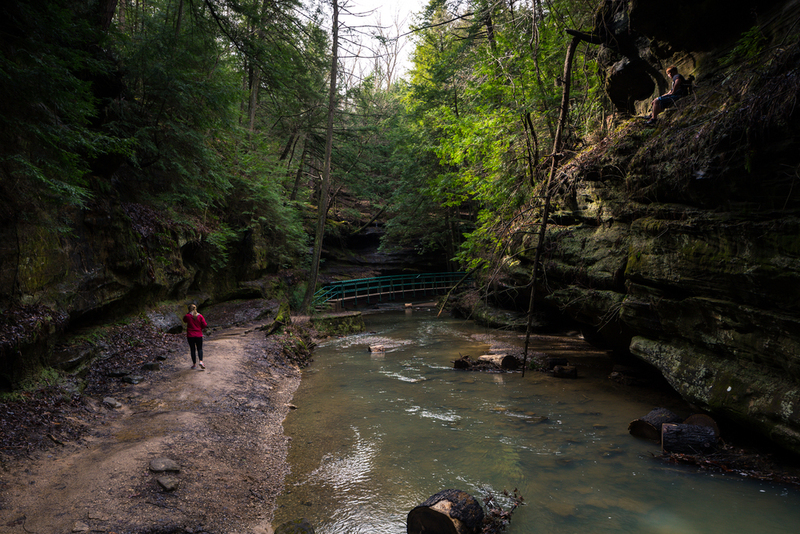 Although most of us from Ohio don't tend to speak highly of the state it does have some sweet spots and luckily for you all I am actually from Hocking Hills, an area most people in the state consider to be of outlandish beauty. Naturally having picked up photography while I was away from home I had to travel out to the local parks and capture the places I grew up seeing in a new light. So when the weather cooperated I bailed my little brother out of school (he was more than pleased), grabbed the camera, and headed off to Old Mans Cave. Something to think of while looking through the images; these were snapped in the last months of winter for the area so sadly it is not as lush and vibrant as I remember but it is still a place worth seeing year round! Also because the tree canopy is not so thick during this time of year some wonderful streams of light make it down into the gorges. If you take the longer routes from up stream and come into the gorge from the lower end it can leave you with an amazing view of the main overhang and the iconic bridge that leads you to the lower falls pictured above. Another more common way to enter is to come down into the gorge almost immediately from under the large overhang pictured below! The photo does not do the scale of the overhang any real justice sadly. From here I stopped to snap a few portraits of my fellow travelers to add to the others I had been capturing along the way and then we headed off to my favorite part and popular swim spot in the summers. The lower falls after some rain make for a wonderful picnic spot or just a great place to snap some photos like we did. Don't let a lack of rain discourage you however because I don't think I have ever been disappointed when visiting. After leaving the lower falls you opted to take a high trail back to the car where I managed to capture some interesting angles down on the steams that run through the area and I highly recommend people not forget about this stuff when photographing places like this. Don't walk around capturing everything from shoulder height, get down on your belly, stand on things, point your camera up to the sky and down tword your feet! Just avoid the dutch angle and crazy HDR techniques and you will be fine. Also for those wonder how to capture the water like I have investing in some LEE filters will be one of the best investments you make as a photographer. Most of these are captured utilizing a combination of LEE Grads and the 10 stop ND filter. Once we left Old Mans Cave we decided to make a quick pit stop at a park closer to home, maybe not even 5 minutes from home honestly. Many people who live not even fifteen minutes from Rockstall have never been and it is a real shame because the place holds real beauty. However it does only have some nice trails for hiking and one really nice set of falls to view so maybe this is why people tend not to visit. And with that last image we are out. I look forward to sharing my future travels across Europe with you all so stay tuned. Sorry for the wait needed to get settled over here!